Howe immigrated from England, and first settled along the Hawesbury river where he helped build a road from Windsor to Sydney. Governor Macquarie recruited him to map out a new route from the Hawesbury to the Hunter River. On 24 October 1819, Howe's party of seven (which included two Aboriginal guides) set out. They reached Doyle's Creek on the Hunter on 5 November 1819. On their next expedition they mapped a route to an area which they called 'St. 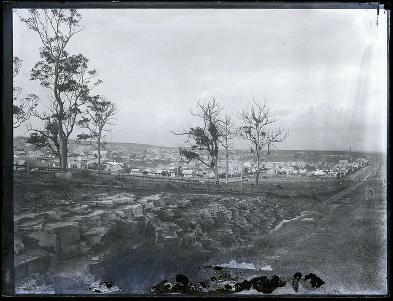 Patrick's Plains' which is current day Singleton. This route was named Howe's Track and followed along current day Bulga Road. Also along on this expedition was Benjamin Singleton for whom the town was named after. Howe retired in 1839, leaving Windsor to live out the remainder of his days on a farm near Morpeth. Many places still bear his name included Howe's Valley, Howe's Mountain, and Howe's Swamp (all near Bulga) and Howe's Park in Singleton. Lambton, [1887 - 1890]. This picture shows Howe road, named after John Howe. From the Norm Barney/Ralph Snowball Collection, University of Newcastle, Cultural Collections. Nancy Gray, 'Howe, John (1774–1852)', Australian Dictionary of Biography, National Centre of Biography, Australian National University, n.d. <http://adb.anu.edu.au/biography/howe-john-2205/text2855> 4 July 2013. Web.